Due to rising fuel costs, e-tolls and congestion caused by the ongoing construction works on the M1 highway, the number of Gautrain passengers has grown significantly over the last few years and has led to the Gautrain Management Agency (GMA) increasing the parking capacity at its stations, in particular at the Centurion station, where some 1 400 new parking bays were added. 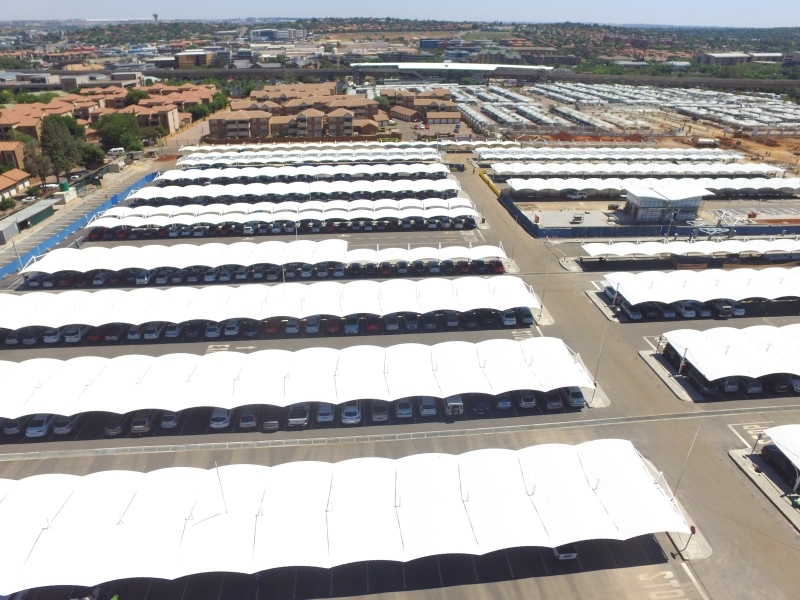 To provide shade for parked cars during the day, Prospan 726 roof sheeting was supplied by Pro Roof Steel & Tube to construct the wavy carports and erected by Voldeo. In total, 38 000m² of ProSpan 762 was roll-formed in Fish Eagle White to create a variety of striking draped roofs, spring curves and mechanical curves. Stefan Marx, concealed fix manager at Pro Roof Steel & Tube, points out that Prospan 726’s strength in spanning and fast erection time makes it an economical choice from a structural and erection point of view. “The narrow pans of pierced fix profiles are also resilient against oil canning and is therefore recommended for any application where aesthetics is a consideration,” he adds. • Optimum wind load resistance. • Roof slope can be as low as 7,5° for sheets shorter than 30m. • Can be spring-curved or draped onto a 26m radius in the convex and 56m in the concave. • Can be factory-cranked to a minimum radius of 450mm. For the roof covering over the various ticket stations, a total of 900m² of ProLok 700 was supplied by Pro Roof Steel & Tube. According to Marx, this product is ideal for commercial and industrial roofing applications. “The excellent water-carrying ability of ProLok 700 ensures low roof pitch structures that are cost effective for the full lifecycle, from design to erection and maintenance. In addition, it has excellent wind-load resistance,” Marx says. • Watertight, long-spanning, wide cover and lightweight. • Deep ribs with excellent water-carrying capacity – roof slope can be as low as 2°. • Three-quarter clip for ease of installation, three fixing points per clip. • Independently tested negative wind load result = 1.95kPa. • Thermal expansion sliding with no associated abrasion or cutting. • Can be spring-curved or draped onto a 36m radius in the convex and 60m in the concave. • Can be cranked to a minimum radius of 500mm. Caption main image: The new, wavy carports at the Gautrain Centurion station were constructed with Prospan 726.